(A) If a covered voter‘s mistake or omission in the completion of a document pursuant to this article does not prevent determining whether a covered voter is eligible to vote, the mistake or omission does not invalidate the document. 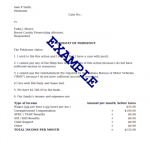 Failure to satisfy a nonsubstantive requirement, such as using paper or envelopes of a specified size or weight, does not invalidate a document submitted pursuant to this article. In a write-in ballot authorized by this article or in a vote for a write-in candidate on a regular ballot, if the intention of the voter is discernable pursuant to the laws of this State, an abbreviation, misspelling, or other minor variation in the form of the name of a candidate or a political party must be accepted as a valid vote.